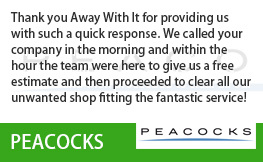 Away With It are an experienced and professional Essex waste removal company. We can cater for any type of property. We remove waste from houses, tower blocks, flats, apartments, basements, lofts, building sites, shops, offices, pubs, gardens, sheds, garages and any other type of property you can think of. Here’s a quick overview of our services. We operate within a 20 mile radius of Loughton Essex, including Loughton, Buckhurst Hill, Chigwell, Woodford, Wanstead, Leytonstone, Romford, Dagenham and Chingford. We will take just about anything away, from a single item to multiple loads. Old furniture and appliances to garden refuse, builders waste, old kitchen and bathroom fittings. You name it we can clear it! Why Use Away With It? 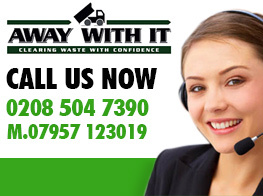 Away with it have been working in the waste removal industry for over a decade. So whatever your question or rubbish clearance need we have the solution. 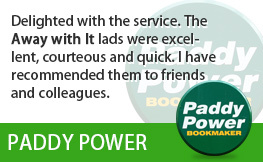 And we can provide a fast, cost effective and flexible 24/7 service. 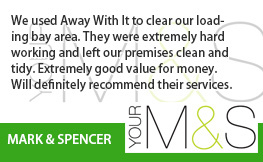 Our friendly two man clearance team will always call ahead to let you know when to expect them so you’re not left hanging around. 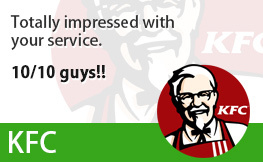 Our prices are based on the percentage of the vehicle you fill. You only pay for the space you use, saving you money. 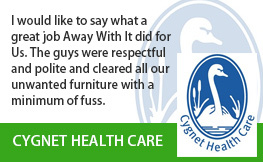 We do all the lifting and loading for you and will even clean up and leave everything neat and tidy after. So you can just sit back and relax. We are fully licensed and regulated. All the waste we collect is transferred safely to a recycling or disposal station and dealt with according to national and local waste disposal regulations. 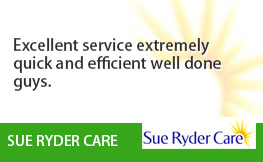 Our services are highly regarded by Essex and London residents and businesses, many of whom come back time and time again.